This is a short story from Chinese author Lu Xun, who happens to be one of my literary heroes. 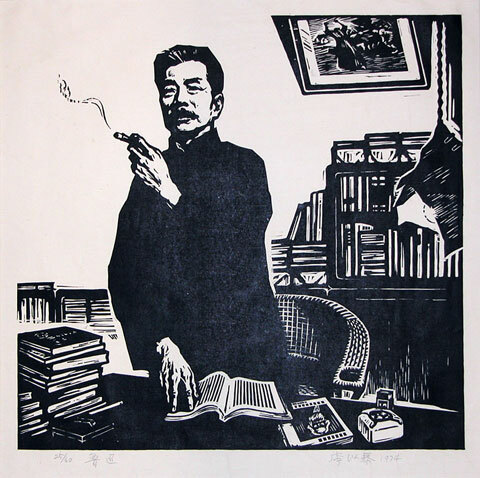 While not well known in the west, he is widely considered the father of modern Chinese literature. Perusing his body of work, it is easy to tell why. New Year’s Eve of the old calendar1 seems after all more like the real New Year’s Eve; for, to say nothing of the villages and towns, even in the air there is a feeling that New Year is coming. From the pale, lowering evening clouds issue frequent flashes of lightning, followed by a rumbling sound of firecrackers celebrating the departure of the Hearth God; while, nearer by, the firecrackers explode even more violently, and before the deafening report dies away the air is filled with a faint smell of powder. It was on such a night that I returned to Luchen, my native place. Although I call it my native place, I had had no home there for some time, so I had to put up temporarily with a certain Mr. Lu, the fourth son of his family. He is a member of our clan, and belongs to the generation before mine, so I ought to call him “Fourth Uncle.” An old student of the imperial college2 who went in for Neo-Confucianism, I found him very little changed in any way, simply slightly older, but without any moustache as yet. When we met, after exchanging a few polite remarks he said I was fatter, and after saying that immediately started a violent attack on the revolutionaries. I knew this was not meant personally, because the object of the attack was still Kang Yu-wei.3 Nevertheless, conversation proved difficult, so that in a short time I found myself alone in the study. The next day I got up very late, and after lunch went out to see some relatives and friends. The day after I did the same. None of them was greatly changed, simply slightly older; but every family was busy preparing for “the sacrifice.” This is the great end-of-year ceremony in Luchen, when people reverently welcome the God of Fortune and solicit good fortune for the coming year. They kill chickens and geese and buy pork, scouring and scrubbing until all the women’s arms turn red in the water. Some of them still wear twisted silver bracelets. After the meat is cooked some chopsticks are thrust into it at random, and this is called the “offering.” It is set out at dawn when incense and candles are lit, and they reverently invite the God of Fortune to come and partake of the offering. Only men can be worshippers, and after the sacrifice they naturally continue to let off firecrackers as before. This happens every year, in every family, provided they can afford to buy the offering and firecrackers; and this year they naturally followed the old custom. The day grew overcast. In the afternoon it actually started to snow, the biggest snow-flakes as large as plum blossom petals fluttered about the sky; and this, combined with the smoke and air of activity, made Luchen appear in a ferment. When I returned to my uncle’s study the roof of the house was already white with snow. The room also appeared brighter, the great red rubbing hanging on the wall showing up very clearly the character for Longevity written by the Taoist saint Chen Tuan.4 One of a pair of scrolls had fallen down and was lying loosely rolled up on the long table, but the other was still hanging there, bearing the words: “By understanding reason we achieve tranquillity of mind.” Idly, I went to turn over the books on the table beneath the window, but all I could find was a pile of what looked like an incomplete set of Kang Hsi’s Dictionary,5a volume of Chiang Yung’s Notes to Chu Hsi’s Philosophical Writings. and a volume of Commentaries on the Four Books.6 At all events, I made up my mind to leave the next day. Besides, the very thought of my meeting with Hsiang Lin’s Wife the day before made me uncomfortable. It happened in the afternoon. I had been visiting a friend in the eastern part of the town. As I came out I met her by the river, and seeing the way she fastened her eyes on me I knew very well she meant to speak to me. Of all the people I had seen this time at Luchen none had changed as much as she: her hair, which had been streaked with white five years before, was now completely white, quite unlike someone in her forties. Her face was fearfully thin and dark in its sallowness, and had moreover lost its former expression of sadness, looking as if carved out of wood. Only an occasional flicker of her eyes showed she was still a living creature. In one hand she carried a wicker basket, in which was a broken bowl, empty; in the other she held a bamboo pole longer than herself, split at the bottom: it was clear she had become a beggar. I stood still, waiting for her to come and ask for money. “You have come back?” she asked me first. “That is very good. You are a scholar, and have travelled too and seen a lot. I just want to ask you something.” Her lustreless eyes suddenly gleamed. I never guessed she would talk to me like this. I stood there taken by surprise. “There may be, I think,” I told her hesitantly. In order to avoid further importunate questions, I walked off, and beat a hasty retreat to my uncle’s house, feeling exceedingly uncomfortable. I thought to myself: “I am afraid my answer will prove dangerous to her. Probably it is just that when other people are celebrating she feels lonely by herself, but could there be another reason? Could she have had some premonition? If there is another reason, and as a result something happens, then, through my answer, I shall be held responsible to a certain extent.” Finally, however, I ended by laughing at myself, thinking that such a chance meeting could have no great significance, and yet I was taking it so to heart; no wonder certain educationalists called me a neurotic. Moreover I had distinctly said, “I am not sure,” contradicting my previous answer; so that even if anything did happen, it would have nothing at all to do with me. “I am not sure” is a most useful phrase. Inexperienced and rash young men often take it upon themselves to solve people’s problems for them or choose doctors for them, and if by any chance things turn out badly, they are probably held to blame; but by simply concluding with this phrase “I am not sure,” one can free oneself of all responsibility. At this time I felt even more strongly the necessity for such a phrase, since even in speaking with a beggar woman there was no dispensing with it. However, I continued to feel uncomfortable, and even after a night’s rest my mind kept running on this, as if I had a premonition of some untoward development. In that oppressive snowy weather, in the gloomy study, this discomfort increased. It would be better to leave: I should go back to town the next day. The boiled shark’s fins in the Fu Hsing Restaurant used to cost a dollar for a large portion, and I wondered if this cheap and delicious dish had increased in price or not. Although the friends who had accompanied me in the old days had scattered, even if I was alone the shark’s fins still had to be tasted. At all events, I made up my mind to leave the next day. At first I felt astonished, then very uncomfortable, thinking these words must refer to me. I looked outside the door, but no one was there. I contained myself with difficulty till their servant came in before dinner to brew a pot of tea, when at last I had a chance to make some enquiries. “With whom was Mr. Lu angry just now?” I asked. “Why, still with Hsiang Lin’s Wife,” he replied briefly. “Hsiang Lin’s Wife? How was that?” I asked again. “How did she die? Why, of poverty of course.” He answered placidly and, still without having raised his head to look at me, went out. However, my agitation was only short-lived, for now that something I had felt imminent had already taken place, I no longer had to take refuge in my “I’m not sure,” or the servant’s expression “dying of poverty” for comfort. My heart already felt lighter. Only from time to time something still seemed to weigh on it. Dinner was served, and my uncle solemnly accompanied me. I wanted to ask about Hsiang Lin’s Wife, but knew that although he had read, “Ghosts and spirits are properties of Nature,”7 he had retained many superstitions, and on the eve of this sacrifice it was out of the question to mention anything like death or illness. In case of necessity one could use veiled allusions, but unfortunately I did not know how to, so although questions kept rising to the tip of my tongue, I had to bite them back. From his solemn expression I suddenly suspected that he looked on me as choosing not earlier nor later but just this time to come and trouble him, and that I was also a bad character; therefore to set his mind at rest I told him at once that I intended to leave Luchen the next day and go back to the city. He did not press me greatly to stay. So we quietly finished the meal. In winter the days are short and, now that it was snowing, darkness already enveloped the whole town. Everybody was busy beneath the lamplight, but outside the windows it was very quiet. Snow-flakes fell on the thickly piled snow, as if they were whispering, making me feel even more lonely. I sat by myself under the yellow gleam of the vegetable oil lamp and thought, “This poor woman, abandoned by people in the dust as a tiresome and worn-out toy, once left her own imprint in the dust, and those who enjoy life must have wondered at her for wishing to prolong her existence; but now at least she has been swept clear by eternity. Whether spirits exist or not I do not know; but in the present world when a meaningless existence ends, so that someone whom others are tired of seeing is no longer seen, it is just as well, both for the individual concerned and for others.” I listened quietly to see if I could hear the snow falling outside the window, still pursuing this train of thought, until gradually I felt less ill at ease. Fragments of her life, seen or heard before, now combined to form one whole. She did not belong to Luchen. One year at the beginning of winter, when my uncle’s family wanted to change their maidservant, Old Mrs. Wei brought her in and introduced her. Her hair was tied with white bands, she wore a black skirt, blue jacket and pale green bodice, and was about twenty-six, with a pale skin but rosy cheeks. Old Mrs. Wei called her Hsiang Lin’s Wife, and said that she was a neighbour of her mother’s family, and because her husband was dead she wanted to go out to work. My uncle knitted his brows and my aunt immediately understood that he disapproved of her because she was a widow. She looked very suitable, though, with big strong feet and hands, and a meek expression; and she had said nothing but showed every sign of being tractable and hard-working. So my aunt paid no attention to my uncle’s frown, but kept her. During the period of probation she worked from morning till night, as if she found resting dull, and she was so strong that she could do a man’s work; accordingly on the third day it was settled, and each month she was to be paid five hundred cash. Everybody called her Hsiang Lin’s Wife. They did not ask her her own name; but since she was introduced by someone from Wei Village who said she was a neighbour, presumably her name was also Wei. She was not very talkative, only answering when other people spoke to her, and her answers were brief. It was not until a dozen days or so had passed that they learned little by little that she still had a severe mother-in-law at home and a younger brother-in-law more than ten years old, who could cut wood. Her husband, who had been a woodcutter too, had died in the spring. He had been ten years younger than she. 8 This little was all that people learned from her. The days passed quickly. She worked as hard as ever; she would eat anything, and did not spare herself. Everybody agreed that the Lu family had found a very good maidservant, who really got through more work than a hard-working man. At the end of the year she swept, mopped, killed chickens and geese and sat up to boil the sacrificial meat, single-handed, so the family did not have to hire extra help. Nevertheless she, on her side, was satisfied; gradually the trace of a smile appeared at the corner of her mouth. She became plumper and her skin whiter. Before long this inference that she had run away was confirmed. About a fortnight later, just as everybody was beginning to forget what had happened, Old Mrs. Wei suddenly called, bringing with her a woman in her thirties who, she said, was the maidservant’s mother-in-law. Although the woman looked like a villager, she behaved with great self-possession and had a ready tongue in her head. After the usual polite remarks she apologized for coming to take her daughter-in-law home, saying there was a great deal to be done at the beginning of spring, and since there were only old people and children at home they were short-handed. “Since it is her mother-in-law who wants her to go back, what is there to be said?” was my uncle’s comment. Thereupon her wages were reckoned up. They amounted to one thousand seven hundred and fifty cash, all of which she had left with her mistress without using a single coin. My aunt gave the entire amount to her mother-in-law. The latter also took her clothes, thanked Mr. and Mrs. Lu and went out. By this time it was already noon. “Oh, the rice! Didn’t Hsiang Lin’s Wife go to wash the rice?” my aunt exclaimed some time later. Probably she was rather hungry, so that she remembered lunch. Thereupon everybody set about looking for the rice basket. My aunt went first to the kitchen, then to the hall, then to the bedroom; but not a trace of it was to be seen anywhere. My uncle went outside, but could not find it either; only when he went right down to the riverside did he see it, set down fair and square on the bank, with a bundle of vegetables beside it. Some people there told him that a boat with a white awning had moored there in the morning, but since the awning covered the boat completely they did not know who was inside, and before this incident no one had paid any attention to it. But when Hsiang Lin’s Wife came to wash rice, two men looking like country people jumped off the boat just as she was kneeling down and seizing hold of her carried her on board. After several shouts and cries, Hsiang Lin’s Wife became silent: they had probably stopped her mouth. Then two women walked up, one of them a stranger and the other Old Mrs. Wei. When the people who told this story tried to peep into the boat they could not see very clearly, but Hsiang Lin’s Wife seemed to be lying bound on the floor of the boat. “Disgraceful! Still …” said my uncle. That day my aunt cooked the midday meal herself, and my cousin Ah Niu lit the fire. After lunch Old Mrs. Wei came again. “Still . . .” said my uncle. Thereupon the business of Hsiang Lin’s Wife was concluded, and before long it was also forgotten. Only my aunt, because the maidservants taken on afterwards were all lazy or fond of stealing food, or else both lazy and fond of stealing food, with not a good one in the lot, still often spoke of Hsiang Lin’s Wife. On such occasions she would always say to herself, “I wonder what has become of her now?” meaning that she would like to have her back. But by the following New Year she too gave up hope. The New Year’s holiday was nearly over when Old Mrs. Wei, already half tipsy, came to pay her respects, and said it was because she had been back to Wei Village to visit her mother’s family and stayed a few days that she had come late. During the course of conversation they naturally came to speak of Hsiang Lin’s Wife. “Aiya! What a mother-in-law!” exclaimed my aunt in amazement. “It wasn’t a question of being willing or not. Of course anyone would have protested. They just tied her up with a rope, stuffed her into the bridal chair, carried her to the man’s house, put on the bridal headdress, performed the ceremony in the hall and locked them in their room; and that was that. But Hsiang Lin’s Wife is quite a character. I heard she really put up a great struggle, and everybody said she was different from other people because she had worked in a scholar’s family. We go-betweens, madam, see a great deal. When widows remarry, some cry and shout, some threaten to commit suicide, some when they have been carried to the man’s house won’t go through the ceremony, and some even smash the wedding candlesticks. But Hsiang Lin’s Wife was different from the rest. They said she shouted and cursed all the way, so that by the time they had carried her to Ho Village she was completely hoarse. When they dragged her out of the chair, although the two chairbearers and her young brother-in-law used all their strength, they couldn’t force her to go through the ceremony. The moment they were careless enough to loosen their grip—gracious Buddha!—she threw herself against a corner of the table and knocked a big hole in her head. The blood poured out; and although they used two handfuls of incense ashes and bandaged her with two pieces of red cloth, they still couldn’t stop the bleeding. Finally it took all of them together to get her shut up with her husband in the bridal chamber, where she went on cursing. Oh, it was really dreadful!” She shook her head, cast down her eyes and said no more. “And after that what happened?” asked my aunt. “They said the next day she still didn’t get up,” said Old Mrs. Wei, raising her eyes. After this even my aunt gave up talking of Hsiang Lin’s Wife. “I was really stupid, really . . .” Hsiang Lin’s Wife raised her listless eyes to say. “I only knew that when it snows the wild beasts in the glen have nothing to eat and may come to the villages; I didn’t know that in spring they came too. I got up at dawn and opened the door, filled a small basket with beans and called our Ah Mao to go and sit on the threshold and shell the beans. He was very obedient and always did as I told him: he went out. Then I chopped wood at the back of the house and washed the rice, and when the rice was in the pan and I wanted to boil the beans I called Ah Mao, but there was no answer; and when I went our to look, all I could see was beans scattered on the ground, but no Ah Mao. He never went to other families to play; and in fact at each place where I went to ask, there was no sign of him. I became desperate, and begged people to go to look for him. Only in the afternoon, after looking everywhere else, did they go to look in the glen and see one of his little shoes caught on a bramble. ‘That’s bad,’ they said, ‘he must have met a wolf.’ And sure enough when they went further in there he was, lying in the wolf’s lair, with all his entrails eaten away, his hand still tightly clutching that little basket. . . .” At this point she started crying, and was unable to complete the sentence. My aunt had been undecided at first, but by the end of this story the rims of her eyes were rather red. After thinking for a moment she told her to take the round basket and bedding into the servants’ quarters. Old Mrs. Wei heaved a long sigh as if relieved of a great burden. Hsiang Lin’s Wife looked a little more at ease than when she first came and, without having to be told the way, quietly took away her bedding. From this time on she worked again as a maidservant in Luchen. Everybody still called her Hsiang Lin’s Wife. However, she had changed a great deal. She had not been there more than three days before her master and mistress realized that she was not as quick as before. Since her memory was much worse, and her impassive face never showed the least trace of a smile, my aunt already expressed herself very far from satisfied. When the woman first arrived, although my uncle frowned as before, because they invariably had such difficulty in finding servants he did not object very strongly, only secretly warned my aunt that while such people may seem very pitiful they exert a bad moral influence. Thus although it would be all right for her to do ordinary work she must not join in the preparations for sacrifice; they would have to prepare all the dishes themselves, for otherwise they would be unclean and the ancestors would not accept them. The most important event in my uncle’s household was the ancestral sacrifice, and formerly this had been the busiest time for Hsiang Lin’s Wife; but now she had very little to do. When the table was placed in the centre of the hall and the curtain fastened, she still remembered how to set out the winecups and chopsticks in the old way. “Hsiang Lin’s Wife, put those down!” said my aunt hastily. She sheepishly withdrew her hand and went to get the candlesticks. After walking round several times without finding anything to do, Hsiang Lin’s Wife could only go hesitantly away. All she did that day was to sit by the stove and feed the fire. The people in the town still called her Hsiang Lin’s Wife, but in a different tone from before; and although they talked to her still, their manner was colder. She did not mind this in the least, only, looking straight in front of her, she would tell everybody her story, which night or day was never out of her mind. “I was really stupid, really,” she would say. “I only knew that when it snows the wild beasts in the glen have nothing to eat and may come to the villages; I didn’t know that in spring they came too. I got up at dawn and opened the door, filled a small basket with beans and called our Ah Mao to go and sit on the threshold and shell them. He was very obedient and always did as I told him: he went out. Then I chopped wood at the back of the house and washed the rice, and when the rice was in the pan and I wanted to boil the beans I called Ah Mao, but there was no answer; and when I went out to look, all I could see was beans scattered on the ground, but no Ah Mao. He never went to other families to play; and in fact at each place where I went to ask, there was no sign of him. I became desperate, and begged people to go to look for him. Only in the afternoon, after looking everywhere else, did they go to look in the glen and see one of his little shoes caught on a bramble. ‘That’s bad,’ they said, ‘he must have met a wolf.’ And sure enough when they went further in there he was, lying in the wolf’s lair, with all his entrails eaten away, his hand still tightly clutching that small basket. . . .” At this point she would start crying and her voice would trail away. This story was rather effective, and when men heard it they often stopped smiling and walked away disconcerted, while the women not only seemed to forgive her but their faces immediately lost their contemptuous look and they added their tears to hers. There were some old women who had not heard her speaking in the street, who went specially to look for her, to hear her sad tale. When her voice trailed away and she started to cry, they joined in, shedding the tears which had gathered in their eyes. Then they sighed, and went away satisfied, exchanging comments. She asked nothing better than to tell her sad story over and over again, often gathering three or four hearers. But before long everybody knew it by heart, until even in the eyes of the most kindly, Buddha fearing old ladies not a trace of tears could be seen. In the end, almost everyone in the town could recite her tale, and it bored and exasperated them to hear it. “I was really stupid, really . . .” she would begin. “Yes, you only knew that in snowy weather the wild beasts in the mountains had nothing to eat and might come down to the villages.” Promptly cutting short her recital, they walked away. She probably did not realize that her story, after having been turned over and tasted by people for so many days, had long since become stale, only exciting disgust and contempt; but from the way people smiled she seemed to know that they were cold and sarcastic, and that there was no need for her to say any more. She would simply look at them, not answering a word. In Luchen people celebrate New Year in a big way: preparations start from the twentieth day of the twelfth month onwards. That year my uncle’s household found it necessary to hire a temporary manservant, but since there was still a great deal to do they also called in another maidservant, Liu Ma, to help. Chickens and geese had to be killed; but Liu Ma was a devout woman who abstained from meat, did not kill living things, and would only wash the sacrificial dishes. Hsiang Lin’s Wife had nothing to do but feed the fire. She sat there, resting, watching Liu Ma as she washed the sacrificial dishes. A light snow began to fall. “Dear me, I was really stupid,” began Hsiang Lin’s Wife, as if to herself, looking at the sky and sighing. “Uh, huh,” she answered vaguely. “Oh dear, you don’t know how strong he was. “Oh dear, you . . . you try for yourself and see.” She smiled. Liu Ma’s lined face broke into a smile too, making it wrinkled like a walnut; her small beady eyes swept Hsiang Lin’s Wife’s forehead and fastened on her eyes. As if rather embarrassed, Hsiang Lin’s Wife immediately stopped smiling, averted her eyes and looked at the snow-flakes. Then terror showed in her face. This was something she had never heard in the mountains. At the time Hsiang Lin’s Wife said nothing, but she must have taken this to heart, for the next morning when she got up there were dark circles beneath her eyes. After breakfast she went to the Tutelary God’s Temple at the west end of the village, and asked to buy a threshold. The temple priests would not agree at first, and only when she shed tears did they give a grudging consent. The price was twelve thousand cash. She had long since given up talking to people, because Ah Mao’s story was received with such contempt; but news of her conversation with Liu Ma that day spread, and many people took a fresh interest in her and came again to tease her into talking. As for the subject, that had naturally changed to deal with the wound on her forehead. “Hsiang Lin’s Wife, I ask you: what made you willing after all that time?” one would cry. “Oh, what a pity, to have had this knock for nothing,” another looking at her scar would agree. Probably she knew from their smiles and tone of voice that they were making fun of her, for she always looked steadily at them without saying a word, and finally did not even turn her head. All day long she kept her lips tightly closed, bearing. on her head the scar which everyone considered a mark of shame, silently shopping, sweeping the floor, washing vegetables, preparing rice. Only after nearly a year did she take from my aunt her wages which had accumulated. She changed them for twelve silver dollars, and asking for leave went to the west end of the town. In less time than it takes for a meal she was back again, looking much comforted, and with an unaccustomed light in her eyes. She told my aunt happily that she had bought a threshold in the Tutelary God’s Temple. When the time came for the ancestral sacrifice at the winter equinox, she worked harder than ever, and seeing my aunt take out the sacrificial utensils and with Ah Niu carry the table into the middle of the hall, she went confidently to fetch the winecups and chopsticks. “Put those down, Hsiang Lin’s Wife!” my aunt called out hastily. She withdrew her hand as if scorched, her face turned ashen-grey, and instead of fetching the candlesticks she just stood there dazed. Only when my uncle came to burn incense and told her to go, did she walk away. This time the change in her was very great, for the next day not only were her eyes sunken, but even her spirit seemed broken. Moreover she became very timid, not only afraid of the dark and shadows, but also of the sight of anyone. Even her own master or mistress made her look as frightened as a little mouse that has come out of its hole in the daytime. For the rest, she would sit stupidly, like a wooden statue. In less than half a year her hair began to turn grey, and her memory became much worse, reaching a point when she was constantly forgetting to go and prepare the rice. “What has come over Hsiang Lin’s Wife? It would really have been better not to have kept her that time.” My aunt would sometimes speak like this in front of her, as if to warn her. However, she remained this way, so that it was impossible to see any hope of her improving. They finally decided to get rid of her and tell her to go back to Old Mrs. Wei. While I was at Luchen they were still only talking of this; but judging by what happened later, it is evident that this was what they must have done. Whether after leaving my uncle’s household she became a beggar, or whether she went first to Old Mrs. Wei’s house and later became a beggar, I do not know. I was woken up by firecrackers exploding noisily close at hand, saw the glow of the yellow oil lamp as large as a bean, and heard the splutter of fireworks as my uncle’s household celebrated the sacrifice. I knew that it was nearly dawn. I felt bewildered, hearing as in a dream the confused continuous sound of distant crackers which seemed to form one dense cloud of noise in the sky, joining the whirling snow-flakes to envelop the whole town. Wrapped in this medley of sound, relaxed and at ease, the doubt which had preyed on me from dawn to early night was swept clean away by the atmosphere of celebration, and I felt only that the saints of heaven and earth had accepted the sacrifice and incense and were all reeling with intoxication in the sky, preparing to give the people of Luchen boundless good fortune. This story comes courtesy of, amusingly, marxists.org. Thank goodness communists are so into sharing.